It was an experiment. 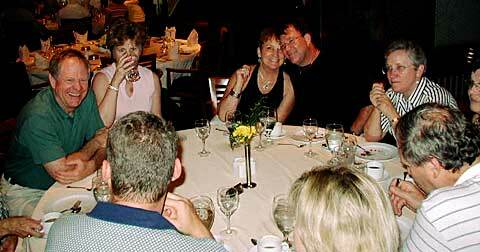 If 47 Morrison Alumni and spouses were placed in a setting of decadence and excess, could they possibly have any fun. Certainly a single Morrison alumnus would have fun on a cruise, but with 46 others on board, then each one would have to consider that his or her actions might generate in the others either indignation or envy. 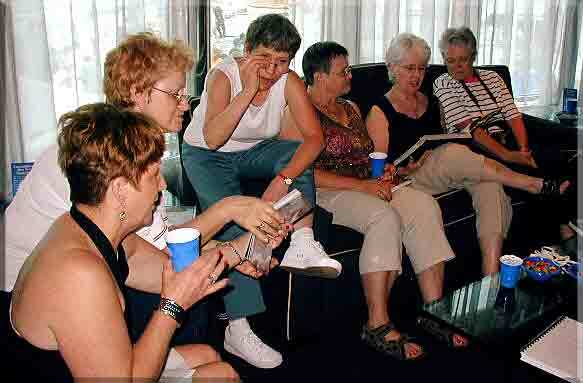 On the first evening, the focus was on connecting with old friends, and a certain decorum prevailed. 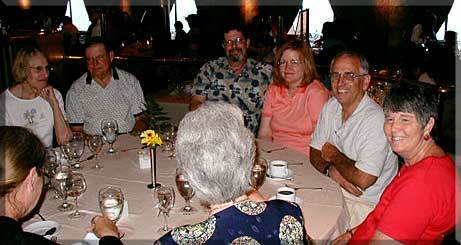 We had five large circular tables in the dining room, and we sat randomly each evening, which gave a chance to visit with everyone during the course of the cruise. However, it was during lunch on the second day that a subtle change began. 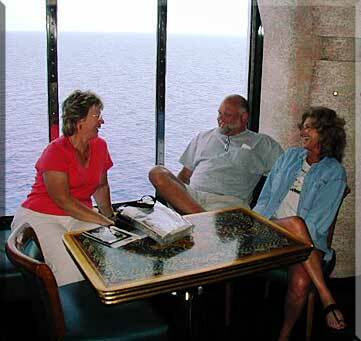 We had nearly finished lunch, when Merrell Gregory announced, "this is a cruise, I can have anything I want, and I want the chilled strawberry soup as my desert." The attentive waiter immediately responded in his Asian accent, "yes maam, you can have anything, I'll get you the chilled strawberry soup appetizer for your desert." The soup was placed over Merrell's left shoulder, and Joy Trachsel May was seen to glance quickly at the enticing bowl. She immediately announced, "I would like the chilled fruit appetizer for my desert." Well, it broke loose from there, Pete Peterson had never heard of flan, but he wanted two of them, Leslie started her Seattle chant, "double decaf latte, half mocha ..." and around the table it went. We were done with lunch, but we kept three waiters running as hard as they could go for another 20 minutes. Stan and Jo Ellen Jenkins had a spacious suite which they provided as a group meeting place, and we used it to keep yearbooks, stashes of sour balls and watermelon seeds, and to swap stories and watch Morrison videos and presentations provided by Bruce Moore and Tim McGill. 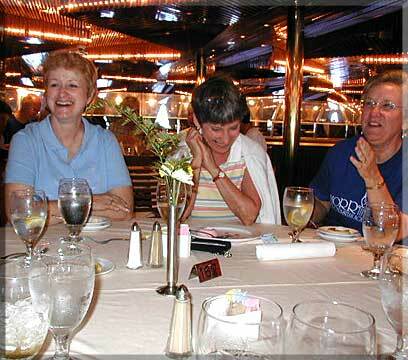 The ship proved to be a perfect venue for both visiting and vacationing. There were numerous nooks and crannies both below decks and above where people could get together, and activities of every description which could be done as a get-away or with others.